14 | May | 2010 | IXA Ready - Fist On! It’s round 3 of Dodgeball Punishment on this week’s edition of AKBingo. The first to be eliminated is Takamina by Myao. Her punishment is to have a balloon stuck under a t-shirt that is to be inflated by gas. When the balloon bursts, Takamina pretends to be K.O’ed on the floor!! Mayu is the 2nd girl eliminated. She’s taken out by Tomochin who really does whip that ball hard. Her punishment is to drink a concotion made from bitter melon (thanks to miitan48 for telling me about this!). It looks disgusting and Mayu has difficulty in drinking it but she gets it all down eventually. The next girl to go is Mikapon whose hit by Acchan. It’s the electric shock treatment for her as punishment whilst she tries to make a hotdog. Not nearly as funny as when Sae got shocked when she tried to eat some food last time. Tomochin strikes again when she takes out Mariko. She has to endure the face painting punishment. She’s made to look like a weird alien clown???. I’m not sure whether the character she’s made to represent is well known in Japan or not? Myao eliminates Kitarie and the 5th punishment is to grab a live eel from a small paddling pool and place it inside a water tank. Her first attempt ends with her bumping into Sayaka and letting the eel fall onto the studio floor. She succeeds though with her 2nd attempt. It’s another electric shock treatment as the 6th punishment with Sayaka taking out Erepyon. Unlike the earlier shock treatment this one is a bit more painful using a vandergraph generator (the instrument which makes your hair stand on end). Erepyon gets a nasty shock from this. Sayaka eliminates another pink team member with Myao. Myao’s punishment is to do the River choreography after spinning around a baseball bat 10 times. She can’t do anything except fall over. This was really funny to see. The next round saw the white team trying their best to take out Acchan after finding out what the punishment was going to be but they failed and it saw Tomochin hit by Myao instead. Tomochin was presented with a plate full of cooked scorpions and she had to eat one of them. She just could not make herself eat one of them. In the end she only ate a tiny piece of leg which was a bit pathetic. Time has run out in this game and it’s a draw. Acchan and Sae for the pink and Miichan and Sayaka for the whites. Sayaka gets the MVP award. We have another Phrase Museum between Acchan and Yuko. Maeda wins. Finally we have the PV for the song Boku no Yell by the Theater Girls which will be on the Ponytail to Shushu CD. It’s the song to support Japan at the World Cup and the PV has a soccer theme running through it too. It’s a nice song and PV. 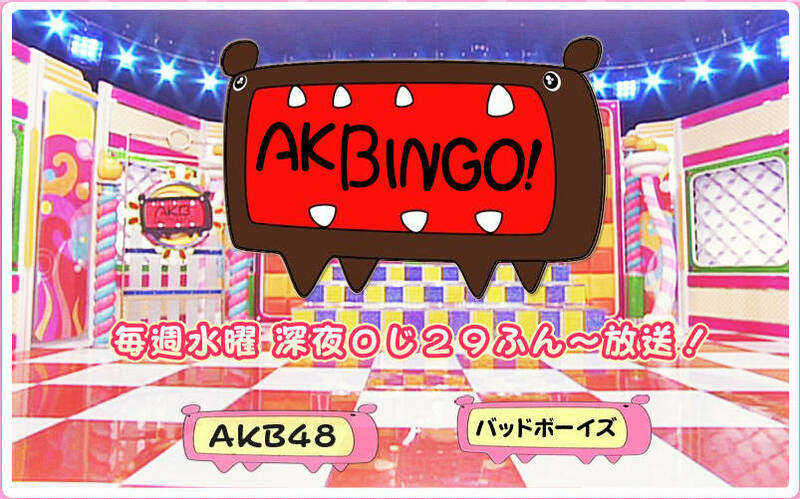 On the 18th May on the late night TV programme Show Battle, various AKB48 members will perform classic J-pop songs. This looks like an intersting show so I’m hoping that it’ll be uploaded on the web after it airs as I’d like to see it. And that is it for this week. Next week’s edition looks like a Candid Camera show with some pranks being pulled on the girls. It also shows Takamina crying. I wonder why?